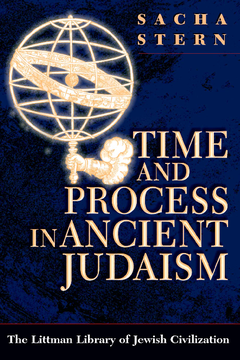 This illuminating study is about the absence of a concept of time in ancient Judaism, and the predominance instead of process in the ancient Jewish world-view. Sacha Stern draws his evidence from the complete range of Jewish sources from this period: mainly early rabbinic literature, but also Jewish Hellenistic literature, Qumran sources, Apocrypha and Pseudepigrapha, and inscriptions. Following a methodological introduction drawing on anthropological studies, the author starts by focusing on the word used for time in early rabbinic literature, zeman. He shows that it means only ‘points in time’ or finite periods of time, but that the concept of time as a continuum—of time as a whole—is totally absent from rabbinic texts. It is unknown even in such obvious contexts as discussions of age, accounts of the creation of the universe, and in other matters relating to timing and time reckoning, the calendar, and chronology. He shows convincingly that although timing was central to early rabbinic halakhah, it was not conceived of as a measuring of the time dimension, but rather as a way of co-ordinating different processes (e.g. co-ordinating the reading of the Shema with sunrise or dusk). The calendar, likewise, was not a measurement of time but an astronomical scheme, and therefore only process-related. Similar conclusions apply to early rabbinic notions of chronology, history, and even ethics: the notion of time as an entity or a resource, so familiar in modern society, is completely unknown in rabbinic ethics. Further confirmation emerges from the author's study of non-rabbinic ancient Jewish sources in Greek, Hebrew and Aramaic, including Apocryphal and Pseudepigraphic works and Dead Sea Scrolls, sources that are also concerned with the calendar and chronology but without any notion of time per se. The absence of a concept of time is also attested in other Near eastern cultures, but stands in contrast to Graeco-Roman culture with its pervasive concept of chronos. The ancient Jewish view also stands in contrast with medieval Judaism, when the concept of time became well established in ethics, philosophy, biblical exegesis, and halakhah, a development which Stern attributes partly to the influence of Greek philosophy on medieval Jewish thinkers. He concludes with reflections on the wider implications of these findings, especially regarding the limited Hellenization of ancient Judaism and its cultural isolation within the Graeco-Roman world. This perceptive work, clearly, cogently, and convincingly argued, offers a new perspective on the world-view of ancient Judaism and its links with other cultures in the Near East of late antiquity. Sacha Stern is Professor of Rabbinic Judaism at University College London. His published works include Jewish Identity in Early Rabbinic Writings (1994) and Calendar and Community: A History of the Jewish Calendar, Second Century BCE–Tenth Century CE (2001).